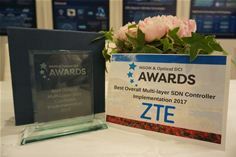 22 June 2017, Shenzhen, China – ZTE Corporation (0763.HK / 000063.SZ), a major international provider of telecommunications, enterprise and consumer technology solutions for the Mobile Internet, today announced it has won the “Best Overall Multi-layer SDN Controller Implementation” award for its innovative ZENIC SDON solution at the annual Next Generation Optical Networking and Optical Data Centre Interconnect (NGON & Optical DCI) event in Nice, France. By using Software Defined Network (SDN) technology on the wavelength division multiplexing (WDM)/optical transport network (OTN), the innovative ZTE’s Elastic Network Intelligent Controller Software Defined Optical Network (ZENIC SDON) solution provides on-demand services such as Bandwidth on Demand (BoD), Performance on Demand (PoD) and Optimization on Demand (OoD), and supports fast service deployment for the L3, L2, L1 and L0 layers, reducing the service deployment time from days and hours to minutes and seconds and dramatically increasing resource use as well as service performance. According to Zhu Yongxing, ZTE’s vice president, ZTE continues focusing on customers’ value as well as innovation in technologies and business models. In addition, ZTE has actively participated in many SDN/NFV projects of standards organisations, and is the first OpenDaylight platinum member in China.